Lori, the author of the blog "Girls in the Garden", turned me on to the idea of wardrobe sewing. She'e been doing a winter wardrobe sew-along for some time. The idea is to sew a group of garments that can easily coordinate with the other garments in the group, creating a month of different looks from a handful of garments. I didn't join the sew-along because at the time, winter was almost over and I was more interested in sewing for the warmer weather. She then went on to post this wardrobe collection from Cabi Canary. I had never heard of this clothing line before but I was very drawn to all the pieces from this wardrobe. I love the colors and designs of all these pieces! These looks are great for dressing up or down, depending on the need. So I started matching up the designs with patterns which was easier than I thought! I actually owned all but one pattern. The bigger challange was finding fabrics that worked with these looks and were similar to the inspiration photos. I now have all my fabrics and patterns for this project. I'm not sure if I'm going to make the white jeans/slacks or the denim jeans. I'm going to make some muslins and see if I can get a good fit. Check out the Cabi Canary link for the full month of looks derived from these garments. I'm incoorporating a pair of shorts and an additional top into the collection. I'm also adding a sundress. I've never worn a lot of yellow but I'm willing to give it a try. I'm making the yellow print top and yellow capris. I'm also doing a pink print top and pink capris to extend all of the wearing options! My goal is to have most of the garments sewn by the end of May. 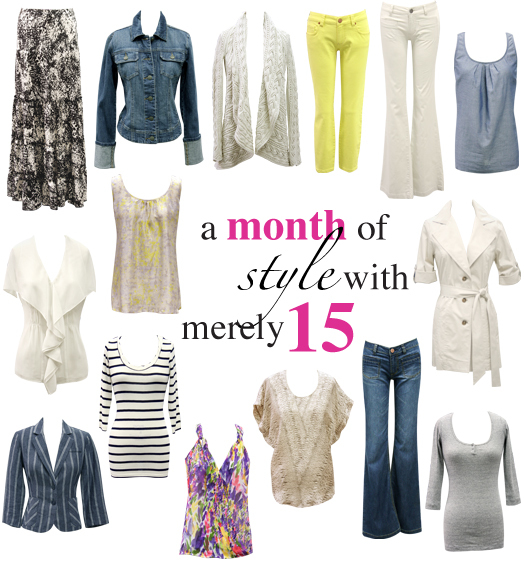 We are taking a vacation to Florida and I think most of these looks will be perfect! I'm excited to see how much less I can pack with all of these wearing options! Denim jacket. Burda Style 02-2010-109. Capri/ankle length pant. Burda Style 07-2010-103. White jean/slack? Maybe Vogue 1051. Tank top. Simplicity 2593 (two prints and one solid blue). Ivory gauze top. Simplicity 1915. Stripe tee. Burda Style 02-2010-112a. Blue blazer. Simplicity 4698 (OOP). Ruffle blouse. Burda Style 08-2009-117. Floral blouse (addition). Simplicity 2892.